Featured in ArLiJo Issue No. 5 with Writer/Translator C. M. Mayo. 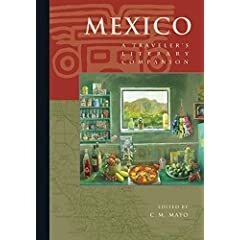 Mexico: A Traveler's Literary Companion edited by C.M. Mayo, (Whereabouts Press, 2006). By permission of the publisher and authors. Her name was Cielo, which means “sky,” and she lived in one of those Baja California towns that, by the end of the 1960s, it seemed the whole world was passing through. If at first it helped kill time, she soon lost count of all the cars, motorcycles, and long-haired gringos who stopped to fill-up on gas or to buy something, and then head on south. They were all going to the Sierra Madre, or even further south, to the Oaxacan coast. Seated on hand-made Hopi-Kachina cushions, they would drink coffee or booze and talk about Ezra Pound and the communitarian nature of artistic creation. For them, poetry was a tribal bonfire and the poet should return to recite his cantos in the plaza. They would go on about this while watching the seagulls fly, and then they would leave. None stayed for more than a couple of days, even with Señora Gómez’s cooking, and the charms of the plump-cheeked and dark-eyed girls who waited on them in the restaurant. The heat, the flies, and the town’s lethargy drove them away. Year after year, summer after summer, the sun parched the grass at the edge of the highway that overlooked the ocean. And year after year, Cielo had only Sundays to rest from the shrill ring of the cash register in the little grocery where she worked. On Sundays she went to mass in her barrio’s church where she sang in the choir, and afterwards, she would go to look at the ocean. She would walk barefoot for a while along the beach, feeling that this cold moistness on her feet was her portion of happiness for the week, and when the sun went down and the mosquitos began to bite her arms and calves, she would put on her shoes and head home to get ready for the next week. It was in the church choir that Cielo met Tacia. Although Tacia was a few years younger, Cielo liked her at once, for she loved animals, she was obsessed with leaning new things, and had a spontaneous and natural tendency to contemplation, but most of all, it was her way of laughing like a country girl, covering her mouth as if she was ashamed to show her teeth or to let anyone hear her. As Cielo remembered it, the morning had been filled with sun. It was one of the first sunny mornings of the year, a day so festive that many of the hippies who were heading south took off almost all their clothes and went to throw themselves on the sand. From the hill where the church was, she could see the dark sand sprinkled with bright bodies braided together in endless kisses. At times, when the breeze from the sea changed direction and blew towards the hill, she could hear singing and the muted twang of a guitar. “Wouldn’t you like to go with them?” Tacia asked her in a voice soft so that no one else would hear. Cielo just crossed her arms. Tacia began to laugh in that funny way of hers, and she moved away, towards the highway. Cielo followed. And they walked along the highway, without looking at the beach. For several months, they went on meeting on Sundays at church. Soon they knew every small detail of each others’s lives. Cielo lived with her sister in the oldest part of town, next to an enormous flour mill that hadn’t worked in several decades. But her sister was rarely home; all day she worked in a packing plant and at night she just came in to change to her clothes and go back out. Tacia, however, still had both of her parents. She lived with them and two sisters and her grandfather, who was paralyzed. Up until this time, Tacia’s inner world had been nourished by his stories about Pancho Villa. The old veteran would relive his memories of the Revolution, when he fought by the general’s side all along the border, and Tacia was much happier to listen to him than sit with her sisters watching the television that never got good reception. Because of her grandfather, she got the idea she wanted to become a nurse— even though her family did not have the money or didn’t want to pay for her studies. In any event, she took advantage of every opportunity to follow her vocation, about which she was learning more each time. Cielo, however, had no ambitions for herself, but she admired her friend and wanted to help her achieve her dreams. There was still time. Tacia had only just graduated from junior high. One day since morning Cielo felt dizzy and she had shivers. By the time she closed up the grocery, she had a fever. Her sister had gone to party in San Diego, but Tacia was with her. Defying her parents, Tacia went to take care of her sick friend. She stayed up with Cielo all night, spoon-feeding her medicines and watching over her sleep until her back hurt from sitting up so long in the bed. Two days later, Cielo was able to get up again, feeling that her sickness was no more than a memory that was actually a pleasant one, for it was lit with the glow of affection, by smiles and words whispered in her ears by a voice full of concern and hope. It so happened that it was nearly mid-day when she opened her eyes and saw how the June light came in only timidly through the closed window of her sickroom. She felt that she longed for air smelling of rain; she got up to open the blinds. Then she got dressed and went out to the street. They were not expecting her at the store yet, so she went for a stroll toward the highway and then down the slope that was covered with wet grass. Waiting stranded on the beach was the only friend she had had until Tacia appeared: an old iron boat, its hull riddled with holes and completely rusted. Many times Cielo had come here to gaze upon it and tell it her secrets. At the end of the afternoon, a few seagulls arrived to roost on the mast. Cielo heard them fighting and screeching for the best perch; she heard the slap of the tide that had begun to rise and she thought of Tacia, of her dark eyes filled with tenderness, and she felt that she would have liked in this moment to stop time. She stayed there sitting on the sand for a long time, until the sun was a red line on the other side of the sea and suddenly, over the sound of the surf, she heard someone calling to her. It was Tacia, who had come looking for her, worried because she had not found her at home. Cielo said nothing; she stood and held out her arms, which were still weak. Night surprised them there on the edge of the highway, innocently hugging each other, each protecting the other, and each noticing how the ocean, far in the distance, had begun to reflect the glittering darkness. The earth gave off a strong and sensual perfume. Many times they hugged each other like this, their tenderness immense and cowardly, each inhaling the scent of the other, incapable of confessing what they felt. Maybe this was their way of protecting that feeling. Because love, while called friendship, can last indefinitely; it survives an earthquake thanks to one of most perverse kinds of hypocrisy. But when it recognizes itself for what it is, when love is called love, then, like Medusa, it turns to stone. A stone statue that soon breaks apart and crumbles. Yes. This is why they never spoke of it: they were afraid that their love would come to an end. And they were embarrassed and confused. A few kilometers away, young people talked about free love and the girls went braless and would make love twenty or thirty times a day. But Cielo and Tacia were confused, and so they suffered. Cielo was the older of the two and she felt responsible. She was the one who would have to put some distance between them. She started out by saying she was really busy, making up problems her sister supposedly had, and that affected her as well. But she could not stop what had begun. One Sunday after mass, Tacia asked to come with her for a walk along the beach, and she brought her to where there was an abandoned ship. She demanded an explanation, and she began to cry. Cielo took her in her arms and she hugged her with all her strength, and the power of this secret and lonely love. She did not know what had happened. September was mild in Baja California. The town awoke blanketed in fog, but it was not cold. And the afternoons were brilliant, golden. Someone on the beach lit up a reefer and began to recite poems. When you are in love, you feel wounded by the slightest things; this is why it is easy to become ungrateful and cruel. Love is also made of this. One day, without saying goodbye, Tacia left. These were the last years of Vietnam and the pressure of the hippies and pacifists meant that there were ever fewer volunteers for the front. Many Mexicans enlisted in the U.S. Army. Tacia offered her services as a nurse. But Cielo did not find this out until many years later, when the war was over and she saw her friend’s name on a list of casualties. She had waited for her for so long... She had waited for her on the beach, in church, in the grocery, every day, every afternoon. Even among the groups of hippies who came in to buy things, she would search for her face, her voice. Time went by and with it that was of life. One day, a girl came into the store. She was wearing a multicolored blouse and sandals and she had flowers in her hair and flowers painted on her cheeks. She bought some tomatoes and a pen, because she said, she was going to write a sonnet. When she left, a speeding car ran her down. She was already dead when the ambulance took her away. Cielo understood that this was the last of a race of young people to whom, who knows how, her friend had belonged. And she felt cold. The following Sunday, on leaving church, an admirer offered her his arm and she accepted it. She was nearly thirty years old and she did not want to go on alone. They went to walk along the highway and then down toward the beach. The iron boat was still there, invincible, like a guardian. The man proposed that they climb up onto it, and this surprised her. It had never occurred to her to that it could be possible to clear this small stretch of water and storm this kingdom of crabs and gulls. Nevertheless, she did not want to; it seemed to her a kind of desecration. The more her companion insisted, the more stubbornly she refused. In the end, he contended himself by moving the boat a little bit and with a pen-knife, scraping off the rust that covered its name. But for Cielo, even this seemed to her an attack on something that should not be touched. The name of the boat, like hundreds of others in North America, was Lady of the Seas. Cielo did not want to know it. When she turned her back to the beach and started walking toward the highway, the only thing in her mind was to forget the past. In the last memory she allowed herself from that time, she saw herself lying naked on the grass, covering her eyes with her arm and trying to catch her breath, while Tacia looked at her and smiled, covering her mouth like a country girl. Lady of the Seas Copyright © 2004 by Agustin Cadena. All rights reserved. Translation Copyright © 2004 by C.M. Mayo. All rights reserved. C.M. Mayo is the author of the widely-lauded travel memoir, Miraculous Air: Journey of a Thousand Miles through Baja California, the Other Mexico, and Sky Over El Nido, which won the Flannery O'Connor Award for Short Fiction. Her poetry has been widely published in literary journals and anthologies, most recently, Poetic Voices Without Borders. Founding editor of Tameme, the bilingual Spanish / English) chapbook press, Mayo is also a translator of contemporary Mexican poetry and fiction. Her anthology of Mexican fiction in translation, Mexico: A Traveler's Literary Companion, was published by Whereabouts Press in March 2006. Agustín Cadena was born in 1963 in the Valle del Mezquital, Mexico. Poet, fiction writer, essayist, and translator, he has published more than twenty books in these genres and received numerous national awards, fellowships and other recognition for his literary work. His most recent book is Los pobres de espíritu, which won Mexico's San Luis Potosí National Prize for Fiction. His writing has been translated into English, Italian and Hungarian as well as adapted for radio and television. He currently teaches a seminar on Mexican culture and literature at the University of Debrecen, in Hungary.